Dry Martini cocktail bar Barcelona. Dry Martini Cocktail Bar is the cocktail bar in Barcelona that has become a world icon in the world of cocktails & drinks. Classic, stylish and vintage cocktail bar on Carrer Aribau, 162 in Barcelona that opened in 1978 and was ranked 20th best bar in the world in the 2012 list of World's 50 best bars published by British magazine Drinks International. This bar is so famous for great cocktails that the owner also writes books and teaches master classes in the art of mixing. 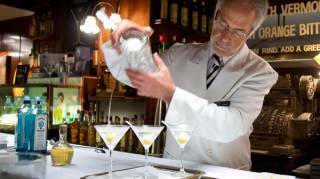 In the beginning Dry Martini remained true to its name and only served Martinis and in 2010 Dry Martini number 1 million was served. But although the love affair with Dry Martinis is still as strong as ever, the bar expanded the drinks list to include other classic cocktails making this a favourite cocktail bar in Barcelona. A visit to Dry Martini is 1 Queen Mary cruise ship, 1 part James Bond and a big dash of style. The cocktail fairytale story of Dry Martini began in 1979 when founder Javier de las Muelas created the iconic cocktail bar Gimlet in the Born area of town on Carrer del Rec. There is still a bar in that location, but it's not called Gimlet,. Gimlet moved a few years ago to its current location on the street Santaló 46 in the upper and posher part of town.Both Gimlet and Dry Martini staff are impeccably uniformed and don't need to consult a recipe book to mix you almost any cocktail you can think of. Today the Javier de las Muelas is a group of high quality cocktail bars and restaurants that also includes clandestine Barcelona restaurant Speakeasy (as same location as Dry Martini), Gimlet, restaurant Casa Fernandez and the Montesquiu brewery in Barcelona - and other establishments thoughout Spain.